Get quick clean pours with the New Star Free-Flow Liquor Pourer. 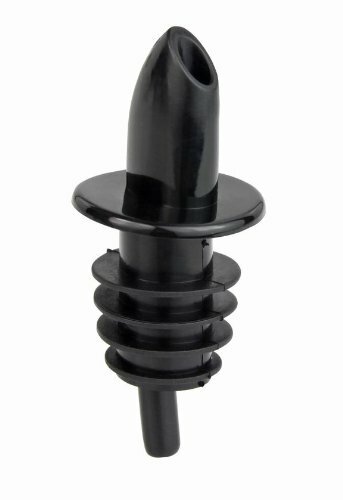 Waste less and serve more with these easy to use and easy to clean black plastic pourers perfect for restaurants and bars. 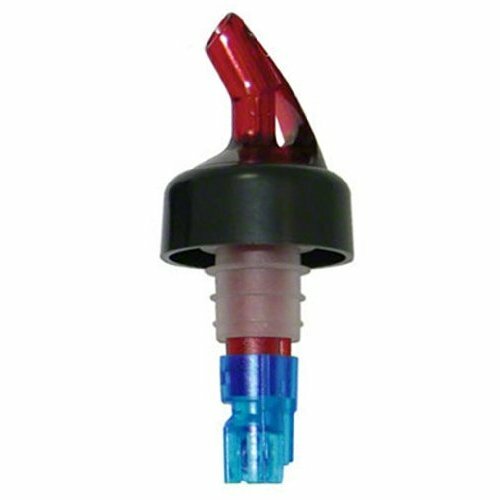 This Carlisle OP30500 Pour Free set contains 12 fluorescent red bottle pourers with a high flow rate for preparing alcoholic beverages. The pourer is made of BPA-free EVA (ethylene-vinyl acetate) for resistance to cracking, and it has a ribbed seal for adhesion. This Pour Free pourer fits most standard glass alcohol bottles and is dishwasher-safe. Introducing the world's first one-piece, free-flow liquor bottle pourers with a bug-proof seal and lid. 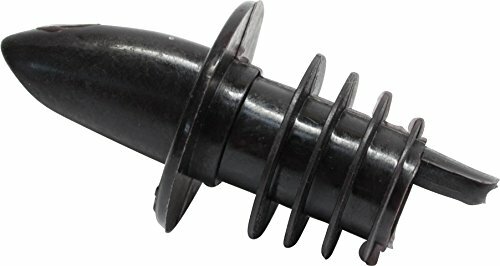 * Made of durable black plastic, these free-flowing pour spouts are one of the fastest, easiest ways to ensure smooth, hassle-free pouring while keeping unwanted bugs out. * Spend more time pouring (and enjoying! ), and less time reaching for the fly swatter. Order your bottle pourers now! 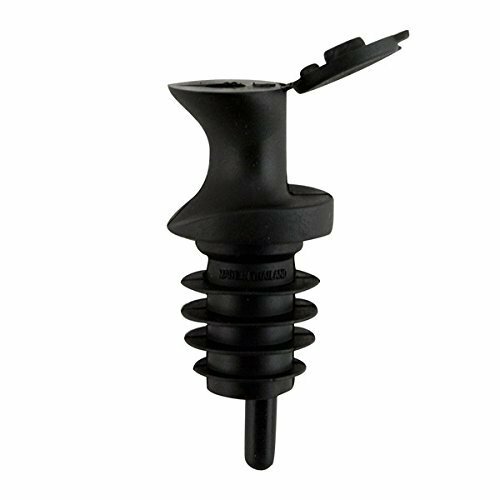 * Specs - Pourer Dimensions: 1 1/8"W x 2 5/8"H. * Includes - (12) Black Pourers. One-piece, free-flow bottle pourer with lid. Hassle-free, easy pouring liquor bottle spout. Set of 12 fits most standard size liquor bottles. Just so you know, may not fit over-sized bottles. This Carlisle OP31600 Pour Free set contains 12 black bottle pourers with a high flow rate for preparing alcoholic beverages. The pourer is made of BPA-free EVA (ethylene-vinyl acetate) for resistance to cracking, and it has a ribbed seal for adhesion. This Pour Free pourer fits most standard glass alcohol bottles and is dishwasher-safe. Introducing free-flow liquor pourers like you've never seen before - with a bug-proof seal and lid. 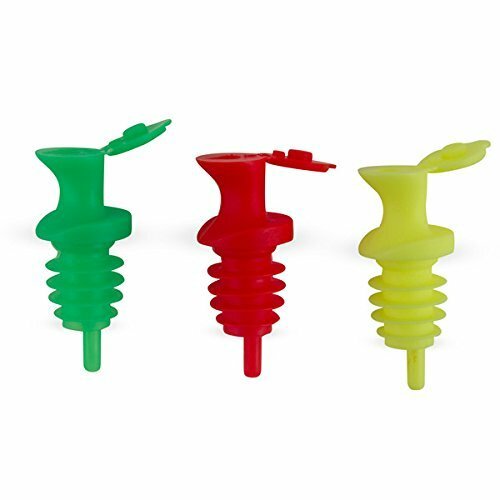 * These neon pour spouts are made of durable plastic and designed to make each liquor bottle pour smooth and hassle-free, while keeping unwanted bugs out. * Want to spend more time enjoying your drinks and less time hunting for the fly swatter? Get your bottle pourers today! * Specs - Pourer Dimensions: 1 1/8"W x 2 5/8"H. * Includes - (4) Neon Red Pourers, (4) Neon Green Pourers, and (4) Neon Yellow Pourers. Hassle-free, easy to pour bottle spout. Made of sturdy plastic in assorted neon colors. The Oxo good grips oil stopper/pourer combination is perfect for pouring and storing fresh olive oil. Use the stopper/pourer to drizzle oil onto your favorite dish or pour oil into a salad. Push the soft, comfortable lever down and the bottle is sealed for storage. Lift the lever up and the seal is opened for drip-free pouring. 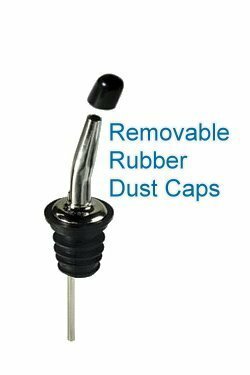 Flexible ribs make the stopper/pourer easy to insert and remove from bottles. This sleek, brushed stainless steel stopper/pourer combination accommodates most size bottles and is dishwasher safe. Molded of an extremely soft flexible material that will last indefinitely. Available in semi-clear, sparkle red, sparkle green, fluorescent red, green, blue, yellow, white, black, and scarlet. Packed one dozen per poly bag. Carlisle Portion Pour san control pourer. Dispenses exact shots of liquor from 1/2-ounces to 2-ounces . BPA free. Dishwasher safe. Made of SAN. 1-1/2-ounces capacity. Made in USA. Plastic liquor pourers at a great price! Sold in 25 count packs. Available in multiple colors. Plastic liquor pourers at a great price! Sold in 25 count packs. Ideal for any bar, restaurant, or home! 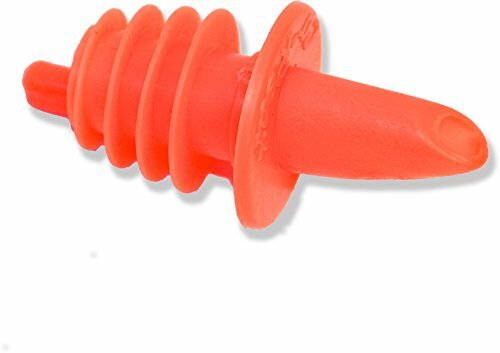 Brand: Barproducts.com, Inc. | Manufacturer: BarProducts.com, Inc.
Lt; this measured pourer is made of color-coded plastic. It is an effortless way to offer controlled pouring and less waste. This pourer is made out of durable Material and will not corrode. Its color symbolizes the measured amount. This pourer can be fit on all liquor bottles. Available in red color. Easy grip tips, makes them very easy to remove and replace and less like to be dropped in the floor while pouring. Durable, flexible vinyl keeps them in place and makes them not easily knocked off. Fits the pourers shown in the pictures plus many others.